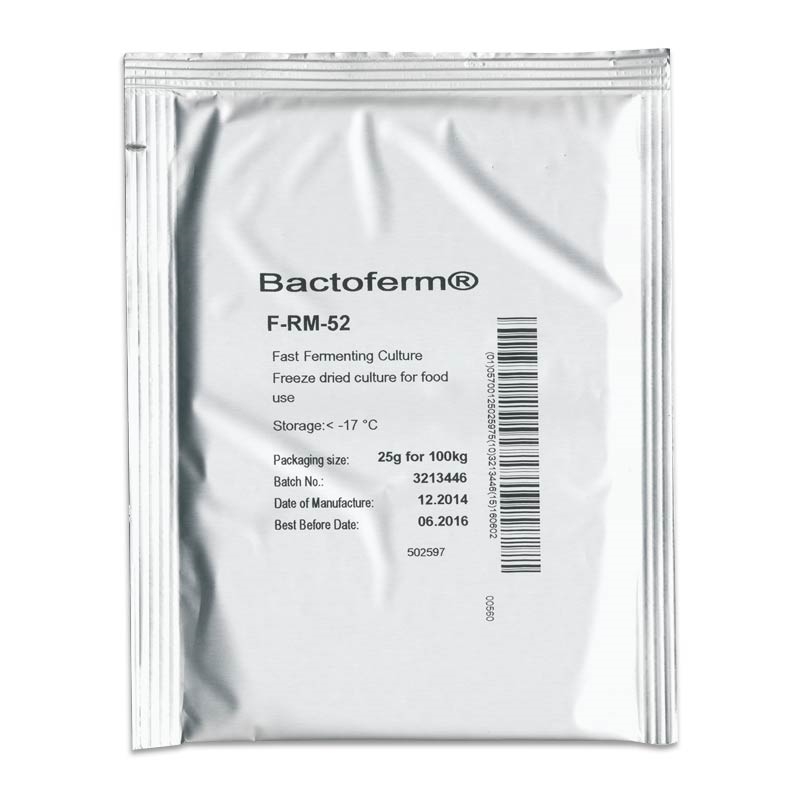 T.S.M.�s Bactoferm F-RM-52 starter culture (model 19008, Lactobacillus Sakei & Staphylococcus Carnosus) is designed for salami production and provides acidification and food fermentation at a medium to fast rate. Many varieties of medium-diameter (of less than an inch to three inches diameter) Sausages found in Northern Europe, such as salami, feature a robust, almost sour flavor. This distinct, robust flavor is produced by boosting lactic acid production, a reaction that results when certain bacteria are added to sausage meat during fermentation. Designed for medium to fast food fermentation and acidification this starter culture is freeze-dried and blends staphylococcus and Bactoferm lactobacillus. 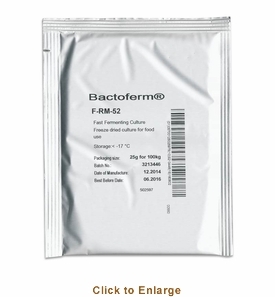 Bactoferm F-RM-52 causes the pH of your ground meat to drop to a level under 5.0 in approximately four days (the level may reach less than 5.4 in two days if produced in an environment at 90�F). When not using this product, keep cultures frozen in sealed package. The shelf life of these frozen cultures is about 6 months; unfrozen, they last a few weeks. Note: T.S.M. highly recommends reading the book �The Art of Making Fermented Sausage� before attempting any method of dry-curing meats. If you feel unsure regarding any of the complex steps involved, do more research! Product for shipment within U.S.A. only.